Like many '60's-'70's musicians who've gotten pigeonholed into that era only, Jeff Beck is only remembered by some, for his recordings with The Jeff Beck Group or Beck, Bogert & Appice. Others discovered Jeff Beck through his 70's fusion releases, Blow by Blow & Wired. Still, others recall a brief 80's encounter with Rod Stewart's vocals on People Get Ready. Not unlike Joni Mitchell, who many can only refer to as "that Big Yellow Taxi chick", both Jeff & Joni continued recording and touring throughout the 80's, 90's and currently, AND have several releases to show for it. Although we seldom hear about them, many musicians actually did survive the 60's & 70's, as well as continue to improve artistically and create new works. Unfortunately, to maintain "popularity", it's better to have died of some exciting unnatural causes. Many guitar players consider Jeff Beck a musicians musician who is still innovating guitar playing. 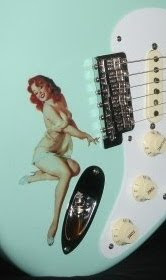 Click here for a great Jeff Beck forum and get up to speed with this master of the Stratocaster.